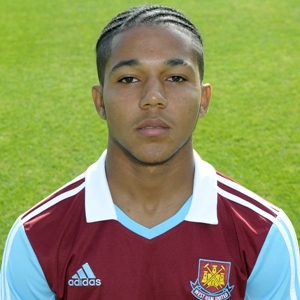 Footballer Djair Parfitt-Williams hit a hat-trick for West Ham United U18s to propel them to a 3-1 victory over Reading on Saturday [Nov 16] in the UK. The winger returned to the starting lineup after missing four games through injury and he turned in a brilliant display, providing the goals that extended the Hammers’ unbeaten run to eight games. The team’s coach told whufc.com: “I thought he played very well, but having said that I wouldn’t say we were a one man team today,” he added. “It was very much a team performance and Djair was on the end of some very good team movements, so credit to him. “It doesn’t take away from the fact that it was a very good all round team performance and I wouldn’t like to single anyone out although Djair will grab the headlines because of the hat-trick which ought to be noted.”"
Parfitt-Williams was born in Bermuda and moved to California when he was eight, and hopes to be able to play for the USA. He was recommended to West Ham by former West Ham legend, Bermudian Clyde Best. Well done Djair….you make us proud! Work hard, play hard. Congrats… Love Aunt Karla. We’ll done Djair….keep reaching for the sky.